Angel Of Truth has fended off a potent New Zealand challenge to win the Australian Derby. Fifteen years after being forced to bypass the Australian Derby with Grand Zulu, Kembla Grange trainer Gwenda Markwell has tasted victory with Angel Of Truth. Grand Zulu had beaten Mummify and Makybe Diva to win the BMW but his owner would not let Markwell back him up in the Derby a week later and he was subsequently sent to Hong Kong to race. Angel Of Truth’s owners were more than keen to run in Saturday’s $2 million Derby (2400m) and the result was a carbon copy of last week’s Tulloch Stakes (2000m) when he led all the way to beat New Zealander Madison County, except for the margin which was greater. Angel Of Truth ($15) had 3-1/4 lengths on Madison County with another New Zealander, Surely Sacred ($13) a long head third. The victory was sweet for Markwell who originally thought Angel Of Truth might be a Queensland Derby contender. “The owner wanted to race Grand Zulu in Hong Kong,” she said. “Everyone tried to get the owner to race him in the Derby. Angel looks like Grand Zulu. He’s the same colour and he ‘s got the same nature. Angel Of Truth’s rider Corey Brown has won two Melbourne Cups, a feat not lost on Markwell who was pleased to get a rider of such quality. Brown said he was confident after the Tulloch Stakes, Angel Of Truth had the necessary qualities to win the blue riband. “It’s easy after the event but I did think he cold do it,” Brown said. “They thought about heading to Brisbane at the tier below but he was as strong after the line last week as he was on it. “Once he got to the front, he did what he liked. Sux hundred metres from home he was travelling and once he gets to his top he sustains it. Madison County’s trainers Murray Baker and Andrew Forsman had cause to celebrate earlier in the day when Nicoletta won the Group One Breeders Stakes at Te Aroha. 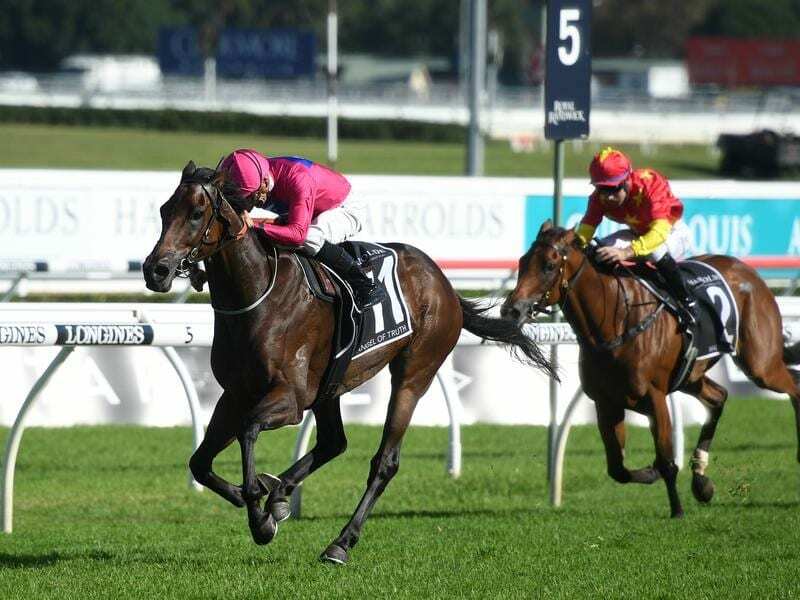 Baker, who has won more Group One races than any other New Zealand based trainer, was in Sydney for the Derby in which Madison County’s stablemate The Chosen One finished fourth. “They’ve run well but the winner was too good,” he said. For Madison County’s rider Tommy Berry, the result was a re-run he didn’t want to see again. “He stayed the trip out well but the leader just got away with murder again so it was always going to be hard,” he said. Angel Of Truth’s Derby win also marked the first Group One success for his sire Animal Kingdom, winner of the 2011 Kentucky Derby and 2013 Dubai World Cup.